A dear friend of mine recently had a celebration of all sorts. We were honoring his birthday, his pending divorce, an end of an era, and the start of a new one. The party was one for the record books. The food and libations were in abundance. The site was a beautiful house in a secluded area of Baltimore County. It was the perfect setting for a day of emotion, revelry, and merriment. The congregation was at epic levels. An in-ground pool, a slip n’ slide course, and a gaming lounge on the inside was provided. The gaming lounge included table tennis, beer pong, card games, and any other drinking game an attendee was motivated to get folks involved in. There was to be an Olympic like obstacle course inspired by the program, Wipeout, but the weather postponed the event and emotional opening ceremonies for a later date. Nevertheless, this was still a part for the ages. Many good pals and friends came out to support our friend in his present and future endeavors. And I was one of those people who almost no showed because of the torrential downpours. I would have regretted that decision if I chose to stay home. A great majority of invited guests still made their appearance and everyone seemed happy they did. The eats were plentiful. We had burgers, hot dogs, chips of all kinds, hummus, pasta salads, and all kinds of various dips. Those were devoured before any pictures were taken. As for the alcohol, there was a beer keg, and plenty of various liquors for mixers. However, I chose to mainly stick with wine, as did a few other folks. 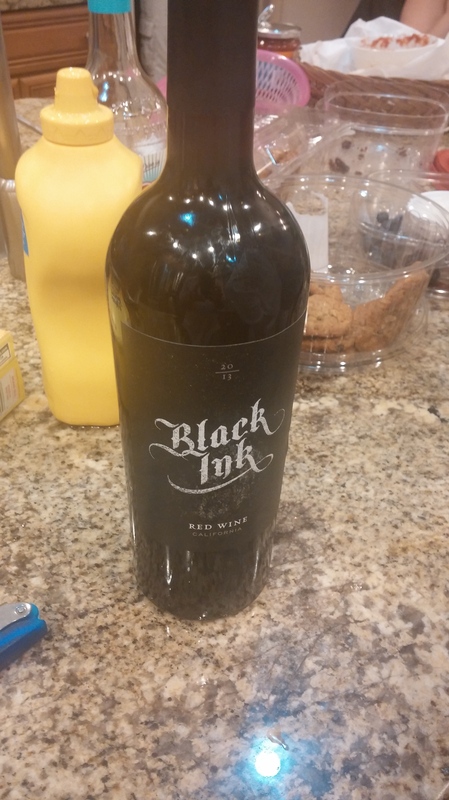 In honor of the ink being nearly dry on my friends divorce proceedings, I arrived with a bottle of Black Ink. I didn’t realize at the time how apropos this choice was. Bear in mind, I could have brought anything. But in tradition of never coming empty-handed to a party, I grabbed a wine that looked fun and stood out from the crowd. The guest of honor is a huge fan of Red Blends, so that factored into the decision. The wine itself was just fine. It’s as mysterious as the website itself, which explains nothing and has no links to click on. Their parent company, sheds a little more light on it. And here’s even more information. I wouldn’t say it was my favorite, but it was a good bottle for the low price of $9.99. There’s an image of a squid under the cap that I wish I had taken a photo of. This is a melange of Syrah, Merlot, Malbec, and, Zinfandel. The smokiness was present, and some hints of spices and obscure flavors. But as to what I don’t know. It was a nice drinking wine by itself or with the food that was decimated throughout the party. More photos would have been taken but I wanted to keep the mystery of the event just like the wine, at the right decibel. No fancy wine glasses for this one. I was happy drinking from a cup. For those that stayed longer, just when we thought the party was winding down, we kept going. It was great to make new friends, reconnect with past ones we’ve lost touch with, and a celebration of life, enjoying the Summer, and feeling good. Some of what transpired is too good for words and pictures. It’s memories that we get to keep for ourselves and share with our loved ones that were there. 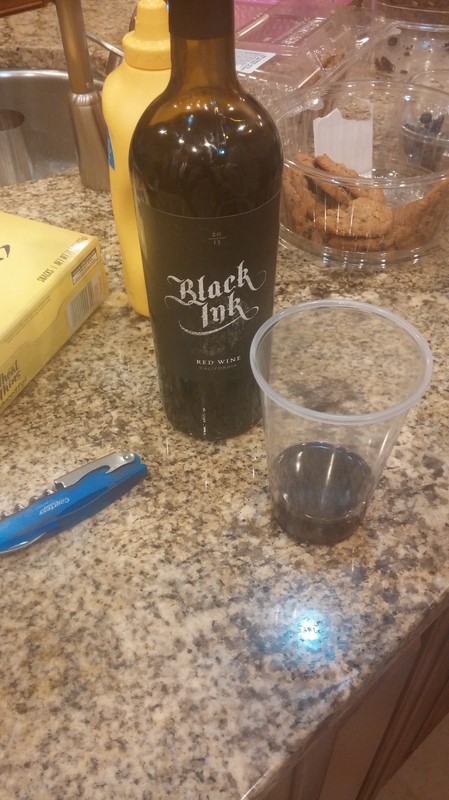 And just like the wine, the ink will soon be dry. Hi Ideen this is Anna (the daughter of the soon owner of this blog)! 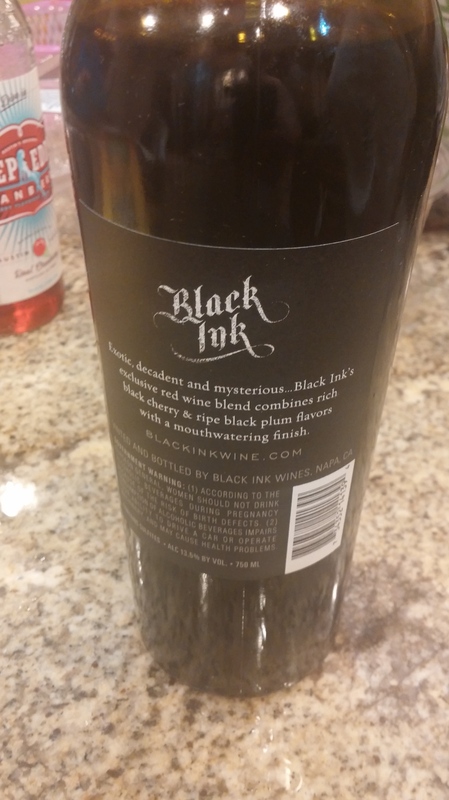 I was just checking out your page and saw your post on black ink and thought it was so ironic because that is one of my father’s favorite new casual wines! we stumbled upon it at a restaurant one night and he was hook and we couldn’t find it anywhere and actually have been ordering it through a local liquor store. For such a cheap wine it is rather good, glad to find someone else who has tried it! Anna, that’s so cool to hear! I’ll admit I was drawn to the label and the great price more than anything else! I love the Red Blends! I appreciate you reading my blog and posting some feedback!!! Thanks so much!